August 6, 2009 - Make sure you like EcoJoes on Facebook to stay updated on green ways to save money and help the environment. Just click the "like" button below. Muchas gracias! The green movement is making inroads even in the lil’ town of Garner. I was in the library last week, lamenting my near-illiteracy while I looked for the picture book section, when I saw these two mysterious boxes in a shelf. 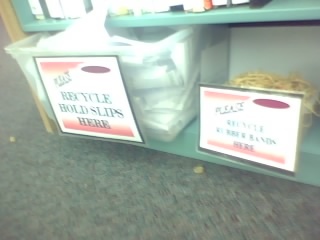 The library is now recycling paper and reusing rubber bands! Hoo-rah! They have a reservation system where they print out your name and rubber-band the paper to a book, so you can find your reserved book. I guess they used to just expect you to throw away the paper and rubber band (committing a major sin against Mother Earth), but they have seen the light and are now reusing them. Anyhoo, it’ll be good to see more and more business start finding ways to both help the environment AND save money. A hearty kudos to the Garner Southeast Library. Posted in books, green business, paper, recycle, reusing, save money	on Thursday, August 6th, 2009 at 9:24 PM. So the thing here is that we need the fifa 18 coins online and it the best way here.